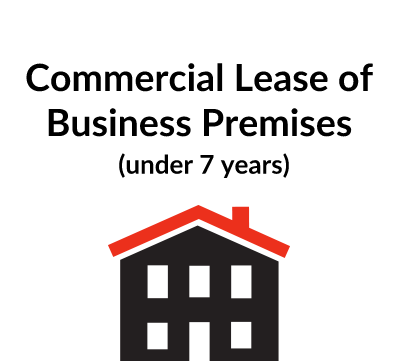 This document is designed to provide an outline of the main commercial points relating to the letting of a commercial property before the formal lease is prepared. You need this document if you are a landlord or tenant looking to outline the main points in a lease of a commercial property, before a formal lease is prepared. 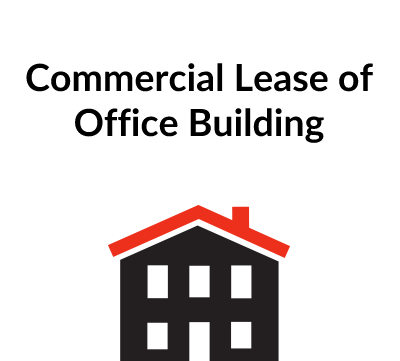 This document is designed to provide an outline of the main commercial points relating to the letting of a commercial property. They reflect the commercial deal and are not drafted to favour one party or the other. In most cases the Heads of Terms will be produced by or on behalf of the Landlord. 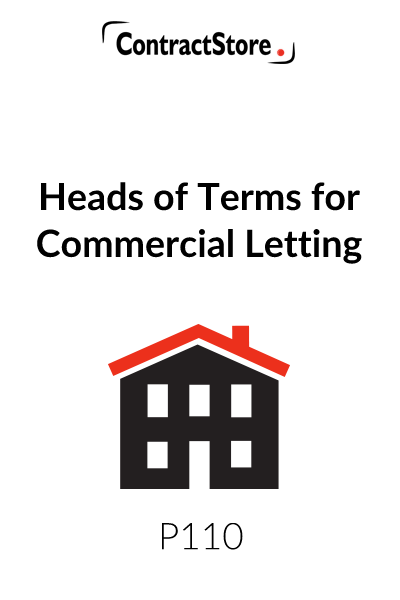 These Heads of Terms will not be suitable if the parties intend that the lease will comply with the Lease Code 2007 (which is a voluntary code about which further information can be obtained on www.leasingbusiness premises.co.uk). Our comments on the specific clauses of the Heads of Terms are set out below. Insert details of the parties here and note that it is particularly important to establish the correct identity of the Tenant at the Heads of Terms stage to avoid delays. A description of the premises to be let should be inserted here and, if possible, identified by reference to a plan. If the Tenant is to be given the right to park vehicles, this should be included and the number of parking spaces specified. The length of the term should be stated. Also to be included is the question of whether the security of tenure provisions of Part II of the Landlord and Tenant Act 1954 will apply or will be excluded. If the parties have negotiated a break clause, the basic terms of the clause to include the break dates and the extent to which the exercise of the break right will be conditional on performance of the Tenant’s covenants should be stated. Details of the initial rent should be included here and whether the rent is to be exclusive or inclusive of VAT, rates and other outgoings. If the rent is to be reviewed, insert details of the frequency and basis of review. If the Landlord requires a rent deposit, the amount and the broad terms upon which it will be held should be specified. (For further information on rent deposits, please see our Explanatory Notes on Rent Deposit Agreements – Ref P109). The Heads of Terms are drafted on the basis that the Tenant will have responsibility for repairs either directly or indirectly through a service charge. If the lease is to be a lease of part of a building or of a unit on an estate, a service charge will usually be payable by the Tenant. The broad terms of the service charge arrangements should be included here and also whether there is to be a cap on the service charge. Whether the Landlord will allow alterations will often be dependant on the nature of the premises, whether the lease is of the whole or part of the building and the length of the term. In a short-term letting of perhaps 3 years or less, an absolute prohibition against all alterations may be appropriate. In the letting of a large warehouse or factory or other industrial premises, the Landlord may only require absolute control over alterations affecting the structure and exterior of the premises leaving the Tenant free to do more or less as he pleases on the inside. In a shopping parade, the Landlord may feel that he wants to have a very tight control over all alterations inside and out in order to maintain the general appearance of the parade and the quality of the development. The Tenant will also want to know whether he can put up signs at the premises. Details of the responsibility for taking out insurance cover, liability for the cost of cover, the extent of the risks to be insured against and responsibility for damage caused by uninsured risks should be included here. Details of the permitted use should be inserted here. Whether there are any restrictions on hours and days of access should also be included. The Landlord generally imposes conditions on giving his consent to a proposed assignment or subletting and these conditions should be inserted here. For instance, the Landlord may require an Authorised Guarantee Agreement from the Tenant in respect of a new tenant and there may be other financial requirements to be met by a new tenant. If underlettings of part are allowed, the part(s) of the premises which may be underlet should be specified and whether there is to be a limit on the number of underlettings which may be permitted at any one time. 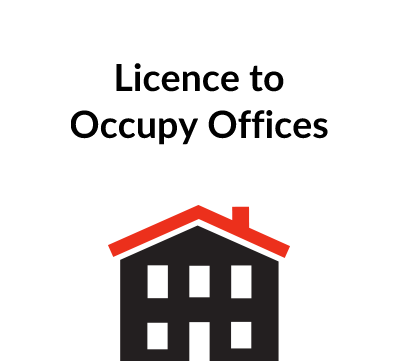 If the Tenant is to be allowed to share occupation of the premises, e.g. to a company within the same group, this right should be included here. Details of the responsibility for legal costs should be inserted here. These need to be identified. 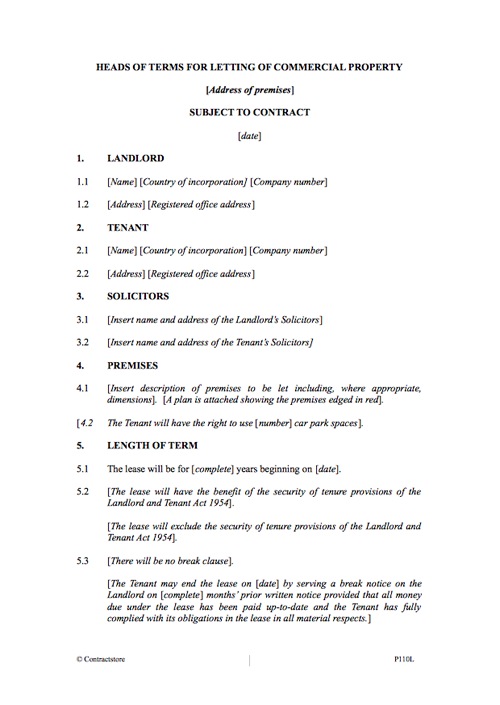 Details of any other conditions to which the Heads of Terms are subject such as board approval or head landlord’s consent should be inserted here.